Press noise creates one of the most prevalent and complicated problems for industrial manufacturers trying to comply with OSHA regulations. The design of presses makes them inherently loud, and the problem is compounded when multiple presses are in use and contribute to a cumulative noise exposure for operators and for nearby workers. Press noise levels in press shops can be as high as 95-115 dBA, which can lead to serious health and safety issues. Due to the potential for hearing loss, OSHA sets the legal limit on permissible exposure limit (PEL) at 90 dBA for all workers for an 8 hour day. There are a number of options for dealing with press noise. Personal ear protection for workers may safeguard the hearing of individual workers, but will not create an environment that allows for communication, which may lead to safety issues. Other solutions, such as the installation of an acoustic enclosure around the press, redesigning the tooling to stagger punches or adding cushioning, can be effective but very expensive. Break through shock is typically associated with a loud boom and press vibration. Specifically, it is the moment in time when the press has built up enough force that it exceeds the shearing strength of the material and the material fractures. 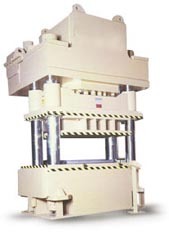 The press components, which are designed to be put into tension, are suddenly put into compression. The sudden release of the stored up energy in the press frame occurs in less than twenty milliseconds. The properly sized hydraulic shock dampers reduce the noise and vibration. The implementation of W-Technologies custom hydraulic shock dampers has led to substantial noise reduction on a variety of presses. Contact us today to learn more!